The European Union said Tuesday it will defend its ban on seal products based on scientific evidence and legislative guidelines that should withstand Canada's challenge of the ban at the World Trade Organization. EU officials said they are confident the 27-nation bloc's decision to ban the import of seal products will withstand the WTO challenge Canada announced it would launch on Monday. "We have checked the WTO legislation, and we are confident that the legislation is in conformity with WTO regulations," said EU spokeswoman Barbara Helfferich. The legislation is not protectionist or discriminatory because it applies to all seal products whether they are from Canada or not, European Commission spokesperson Lutz Gullner told Agence France-Presse. "If others choose to challenge it in the WTO, then the European Commission will vigorously defend it," he said. The EU approved the ban at a meeting of foreign ministers in Brussels on Monday without debate. Canada has argued the ban — which applies to all products and processed goods derived from seals, including fur, meat, oil blubber and even omega-3 pills made from seal oil — is an unfair trade restriction. The import ban in all 27 EU member countries is expected to take effect in October and apply to the 2010 hunting season. The new rules still let Canada ship seal products through Europe but bar the promotion of the products. The regulations also exempt products from traditional hunts carried out by Inuit in Canada, Greenland, Alaska and Russia. The EU has said its decision to ban the seal products came in response to mounting public pressure questioning whether the annual hunt, was humane. 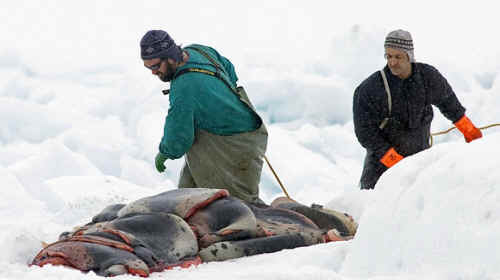 Seal hunters use rifles to kill their prey or occasionally bludgeon them with the blunt end of a hakapik. Giovanni Di Girolamo, the European Commission's representative in Canada, said most Europeans feel the hunt is inhumane. "People feel this hunting is not necessary," Di Girolamo told CBC News. "This kind of product derived from hunting, from animals — they don't want, in the end, for it to be sold in the Union." While the European Commission says its decision was based on scientific studies, Canada will argue its own studies prove the hunt is humane. The seal hunt has been determined by veterinarians to be humane and follows the environmental rules of sustainability, Trade Minister Stockwell Day said Monday when he announced the WTO challenge. "It is, in our view, inappropriate that a trade decision is taken which is not based on science," Day said. The EU ban should include an exemption for countries that humanely harvest seal products, Day said. WTO consultations are expected to last for 60 days, after which Canada will launch an official appeal if no agreement is reached.